← Should We Stick Our Heads in the Sand? Not a reading rug in sight. Commissioner Dotty Lewandowski speaks to the crowd. I bet that former New York City Parks Commissioner Robert Moses (a fitness maven himself) would have enjoyed the scene. It resembled a gym class at the still-closed Beach Channel High School, except that there were adults in the floor spots at the Knights of Columbus on Tuesday, January 8, 2013. By 7:30 p.m., it was questionable whether there would be a quorum of the 50 or so sitting appointees at the regular monthly meeting of Community Board 14. 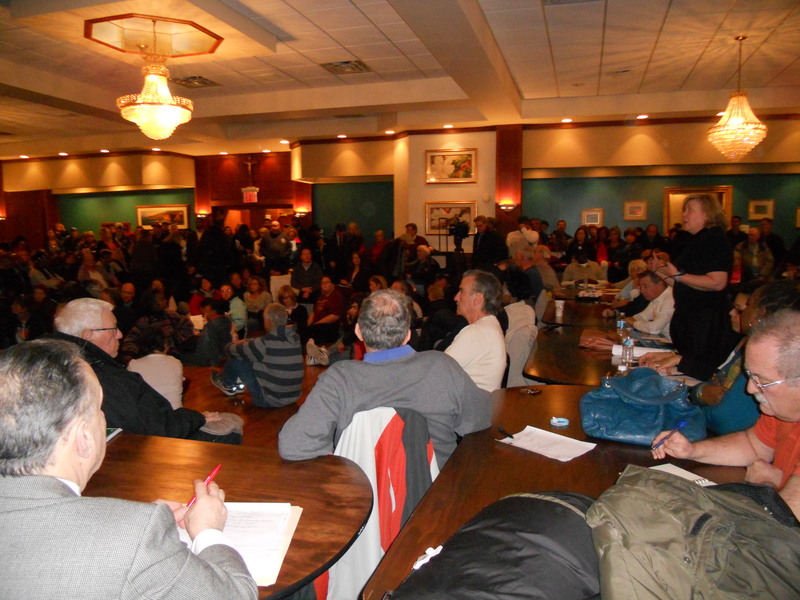 Yet over 250 members of the public had packed the room to hear Dotty Lewandowski, Queens Parks Commissioner, explain the plans to repair the Rockaway beach and boardwalk for the upcoming summer season. Eventually, a quorum of board members seemed to narrowly materialize, and the Commissioner’s informative slideshow was projected onto a wall in a recessed alcove at the back of the room. Unfortunately, only standees at the back near the door, and spectators with the will (and cushioning) to seat themselves on the floor were able to see. No reading rugs in this room! From my perspective, after years of attending these meetings, the turnout was the big story. When the Facebook crowd decides to show up in person (which isn’t often), they can overfill all the available venues quite nicely. With a February 19 special election just announced to fill James Sanders, Jr.’s City Council seat this week, candidates also got to work. Jacques Leandre from Southeast Queens appeared, which was a sighting as rare as a white pelican in Jamaica Bay. It was hard to tell who was lining the back walls, but Donovan Richards (Sanders’ protege) may have been there, as well. Barry Grodenchik, a regular attendee, is now running to replace Borough President Helen Marshall at the conclusion of her term, so he made sure to take his place at the table. Although Assemblyman Philip Goldfeder was in Albany for the following day’s State of the State speech, his press aide, Angelica Katz, was there, as were Jerry Sullivan and Sandee Doremus, staffers for City Councilman Eric Ulrich and State Senator Joseph P. Addabbo, Jr., respectively. Jerry and Sandee must have called or texted their employers, as Ulrich and Addabbo both showed up, by mid-meeting. In what seemed like an ironic twist, both electeds announced that they are looking for new office space in Rockaway. Real estate broker alert! 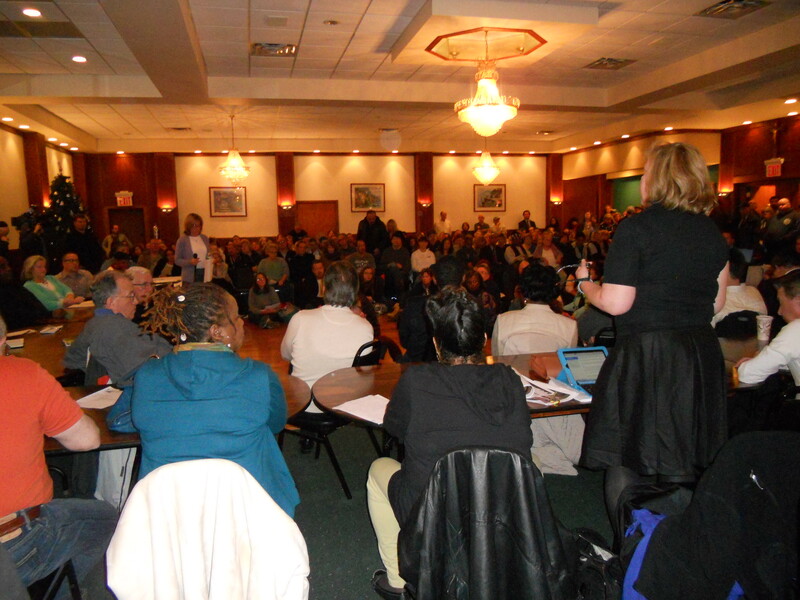 CB 14 panel member Noreen Ellis, President of Rockaway Civic Association, asserts concerns on behalf of homeowners. Commissioner Lewandowski’s focus is clearly on securing the safety of the remaining structures and debris on the beach in the short term, and creating some limited access islands for next summer, to help keep the tourism spigot flowing. There was a great deal of discussion about the replacement surface (wood vs. concrete vs. plastic), and the Parks Department plans to try a combination of these options that has not yet been firmed up completely. Some sections will remain as is, some will be repaired with similar wood surfaces, and a piece will be left where it floated, as a historical remnant. Of the 30 or so individuals who signed up for 3 minutes of public speaking time, there were many homeowners concerned that the beach sand be replaced and secured in some way, so that a new storm does not inundate us with sand, debris, and water again. Judging from past local controversies, there are not many willing to be vocal advocates for a natural vegetated dune system, but I spoke in favor dunes anyway, because it is clearly the right thing to do. At least I wasn’t booed or hissed. That’s progress. The regular meetings of Community Board 14 occur on the second Tuesday of the month. In February, the U.S. Army Corps of Engineers will be speaking about beach replenishment. Another large crowd is expected. Due to the larger than usual attendance since meetings recommenced post-storm, Ulrich and Addabbo are not the only ones looking for a good real estate broker. 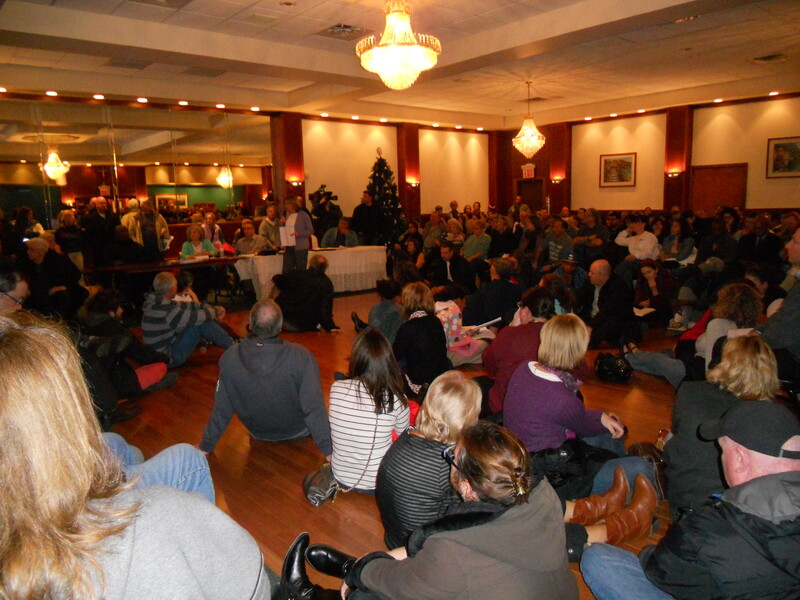 Anybody know of a nice, centrally-located meeting room on the peninsula with seating for 300 or more? Booking school auditoriums involves a lot of red tape these days, and many of the floors in the larger church halls (like St. Camillus, St. Francis and First Congregational) were heavily damaged by the storm. Text and meeting photos copyright 2013, Vivian R. Carter. Dune photo copyright 2012, Vivian R. Carter. 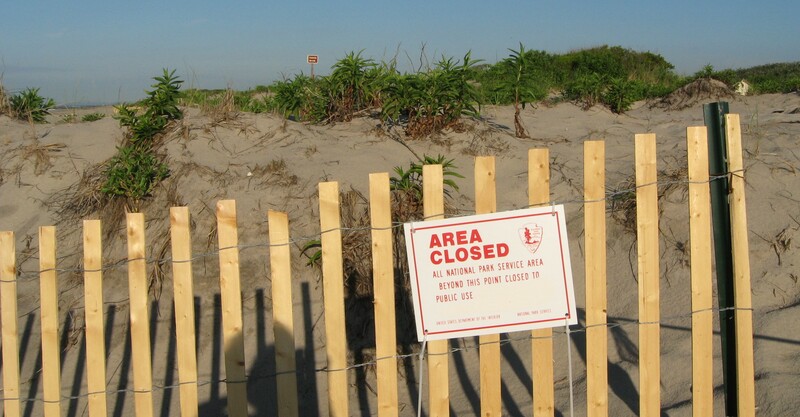 This entry was posted in Local Government-Rockaway Peninsula & Broad Channel, New York City Government and tagged Boardwalk, community, Hurricane Sandy, NYC Parks & Recreation, Rockaway, waterfront access, weather events. Bookmark the permalink.